Videos, solutions, worksheets, stories and songs to help Grade 6 students learn how to add and subtract integers using zero pairs. This method involves canceling out positive and negative pairs and what is left would be the answer. 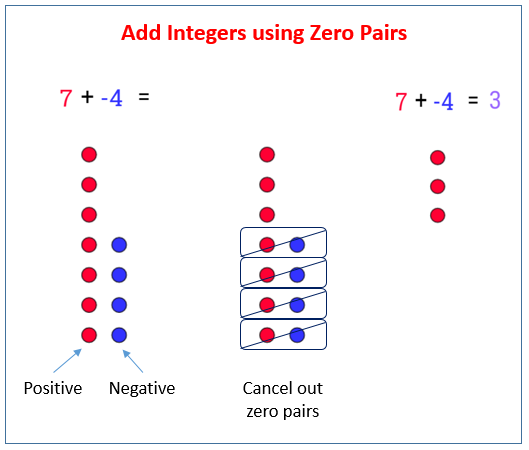 The following figure shows how to add integers using zero pairs. Scroll down the page for more examples and solutions. Zero pairs are defined, discussed and utilized in the introductory video on zero pairs. How to add and subtract Integers? Using integer dots to demonstrate the adding of integers using zero pairs. The positive dots and negative dots cancel to leave the answer. How to add Integers using the number line and zero pairs? How to subtract positive and negative integers through the use of Red (negative) and Black (positive) tiles? We introduce the concept of zero-pairs in this video lesson.